My experience at New Perspective at Prior Lake was very positive. I liked the apartments they showed me. The dining room was nice, clean, and spacious. I liked their menus. I haven't tried their food, but it looked very good. I liked the activities that they had for all the residents. They had an exercise room and a chapel. Not what it was formerly. Recent changes have resulted in many vacancies rather than the previous waiting list. Executive chef has been replaced and food is now a disgrace. Frequently inedible. Mostly unhealthy. Mostly unappetizing. Emphasis on starches and very light on vegetables and even protein. Frequent use of corn syrup and sugar. No accommodation for special dietary needs. Not even diabetic menu selections. Smaller portions and they now charge $8. extra for providing more food at a meal. Recent instances of a delayed and even no response to beeps for assistance. Rents were just increased 4% for 2017. Though staff is very friendly we are looking to relocate our relatives elsewhere. Small community of residents, offering a great option to those who enjoy socialization and working with staff members on a deep level. Friendly residents who have the organization in their hearts, expressed their satisfaction with the program because of how knowledgeable and resourceful staff members were, and how cared for they felt. The residents are always busy with something new. Staff members created a great atmosphere of open communication, typically by forming lasting bonds with the residents and being aware of their needs. They were able to sense when something is wrong even when residents failed to express their concerns. My father lived there briefly until he died in his room. The experience of this facility was in my opinion below average and lack of quality care. The communication many times was difficult with the executive director about his care, when we complained she said things would get better but it really never did. He was left in the dining room on more than one occasion for over an hour ringing his pendent for someone to come and help him and bring him to his room about 35 feet away, in that time his soiled his pants. One time an aide stripped a toothbrush from his hands while he was brushing his teeth. Once he hit his head and told me and my father-in-law and had a mark in his forehead but for some reason it was not documented and staff never told me. There were other incidents I have documented. After he died they overcharged him for services he never received, after complaining to management about overcharging and the lack of care we were refunded and I was called "bitter" in the process for caring about my father. I would not recommend this place. The best way to get to know a community is by scheduling a tour. 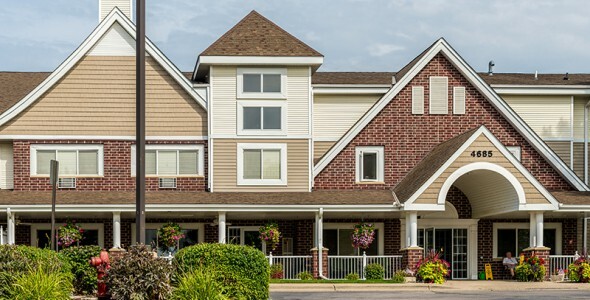 See the facilities, meet the staff and residents, and get a feel first hand what it's like to live at New Perspective | Prior Lake Assisted Living. When you are truly ready to enjoy retirement and leave life's responsibilities behind, then Keystone of Prior Lake is ready to become your new home. With our inviting, elegant surroundings and apartment homes that include all the features of a house without the maintenance, you will quickly fall in love with our community. And with your free time, now you can pursue activities and personal hobbies whenever you want! Keystone Senior Living is a Minnesota-based senior living provider, and we are committed to delivering services with integrity, dignity and compassion. Our communities are designed to support maximum independence and have distinct characteristics not found in other senior lifestyle residences, which makes for a life filled with vitality and joy. A picnic at Cleary Lake, an arboretum tour or a pontoon ride are just a few of the activities that you can participate in after joining our vibrant, active community. Our activities director creates a monthly calendar that is filled with engaging activities. For those days when you just want to relax, you can visit the library or outdoor patios. Keystone of Prior Lake features studio, one- and two-bedroom apartment homes that boast all the amenities of a house, including kitchens, in-suite climate control, spacious closets and an in-unit washer/dryer. Some floor plans even have a deck or patio option. For safety, there is a pull cord system in each bedroom and bathroom. Dining with friends is always on the menu in the community dining room! You will feel like you are dining out each night because our chef-inspired meals served restaurant-style. Our independent living residents enjoy one meal a day, while our residents in assisted living or memory care receive three meals a day. Other helpful features are our on-site beauty/barber shop, an Internet Café and scheduled transportation. With our community also offering assisted living and memory care, our residents feel secure knowing their health care needs will be met in the future. Those in assisted living receive a specially designed care package which supports their health and well-being. Through our signature Willows memory care program, we preserve the autonomy and health, for as long as possible, of seniors with Alzheimer's and dementia. When you join Keystone of Prior Lake, you will discover a new life filled with new friendships and opportunities to enjoy life.